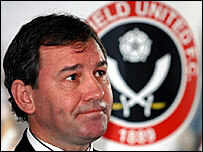 Sheffield United manager Bryan Robson has left the club after turning down a new "head of football" role. Former Leeds and Luton boss Kevin Blackwell has been named as his replacement until the season ends. Robson, 51, who has previously managed Middlesbrough, Bradford and West Brom, joined eight months ago but managed to oversee only 14 wins in 39 games. Blackwell, who was Blades assistant boss from 2000-2004, will have Sam Ellis as his number two. The new Blades' boss told BBC Radio Sheffield: "I had some of my best times here. It helped build my reputation as a coach. It's a stable club, something I've desperately missed since I left and the fans here are as passionate as can be. "I have some great memories of working at this club, it's very special to me "
Robson met club chairman Terry Robinson and plc chairman Kevin McCabe on Wednesday to discuss "reasoned changes to the football infrastructure". But after turning down their proposal he and his assistant Brian Kidd have now left Bramall Lane. "I had hoped Bryan would take up a new role at the club but that was not to be," said McCabe. "Kevin and Sam are in until the end of the season, when we will take stock. "They know the situation and how we are determined to take this club forward. That will include the pursuit of a football supremo to oversee a new structure." The Blades lie 16th in the Championship, seven points off the relegation zone and fans protested against Robson after Saturday's goalless draw with Scunthorpe. Blackwell is a popular figure at the south Yorkshire club, with fans regarding him as pivotal in their successful 2002-3 season, when they reached the semi-finals of the FA Cup and League Cup, and the play-off final. He was appointed Leeds boss in 2004 and guided them to the Championship play-off final in 2006. After leaving Elland Road in November 2006 he took the reins at Luton in January 2007, but was sacked by the club's administrators a year later. Blackwell had already handed in his resignation at Luton and stated his intention to leave the club on 9 February when he was dismissed from his role at the club. His first match in charge of Sheffield United will be the FA Cup fifth-round tie against Middlesbrough on Sunday. Robson believed pressure from disgruntled Blades' fans led to his downfall. He said: "The pressure came from the supporters. There's a lot to be said for fan power but they don't always take into consideration the full workings of what goes on behind the scenes at a football club. "The role Sheffield United offered me was fantastic but it isn't what I want in my career at the moment." Robinson, meanwhile, is to step down from his role at the end of the season, but will stay on as a director.